Central Park is not just a park. It’s a world in itself. With over 100 works of art and architecture, more than 35 lawns and landscapes, numerous film locations, where do you even begin to explore? Let us help you discover this wonderful park by bike. We cherry picked the best venues for you to visit. Bike with us to the famous memorial site for John Lennon; Strawberry Field and The Boathouse. Learn why the Bethesda Fountain is called the Angel of the Water, and find out the truth about the Friends Fountain. Discover what species live in the park, besides New Yorkers and tourists. Let our tour guides tell you what the actual function of the Reservoir was, and who lives in the famous San Remo buildings. Linger at the Bethesda Terrace enjoying live street performances, and try to catch a squirrel on your front wheel. We will even tell you why New Yorkers dislike the squirrels that you find so adorable! Also, our tour guides don’t just know everything about the park, they can also tell you from their own experience what it means to be a New Yorker. Cost $ 55 per person. Prices are excl. 8,875% tax. Are you biking with your kids? We have child seats for toddlers up to 45 lbs or 20 kilos and children’s bikes available. Our licensed tour guides speak Dutch and English. 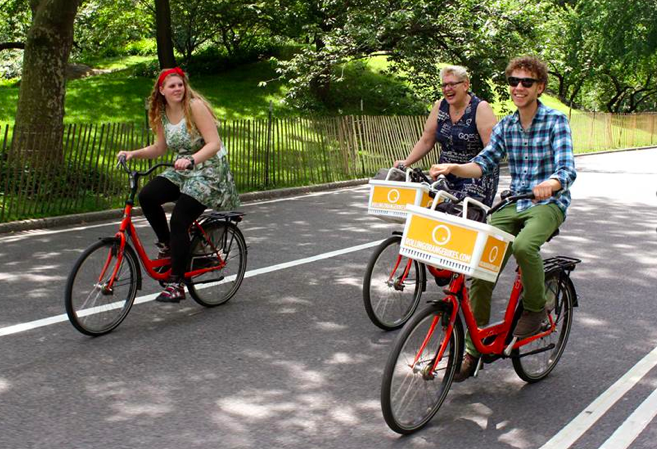 Book the Central Park bike tour using this link. Please let us know how many people your party is and what is your preferred tour date.